This Sunday is Mother’s Day in Japan. At supermarkets across the country, children can submit drawings of their moms to have tacked up in the store. The drawings are cute, simple reminders of the joys of motherhood. There’s nothing sweeter than children’s art. This is not children’s art. 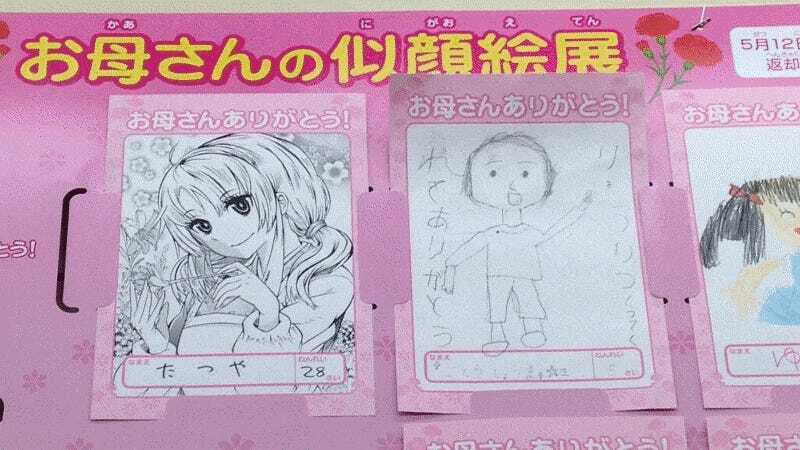 Convenience store chain 7-Eleven as well as supermarkets across the country have children draw their moms in “Mother’s Portraits” that are displayed for all to see. Children are supposed to draw pictures that look like their moms. Most of these artists are little kids. A few of them are big kids. Like, really big kids. And they are much more skilled at drawing, resulting in some amusing pictures of dear old mom. Some do draw realistic renditions of their mothers. Some artists write their real age, while others scrawl lies in childlike handwriting. No way did a five-year-old draw this. This isn’t just a gag or a way to troll 7-Eleven. It’s a way to do all that and show mom the appreciation she deserves. Happy Mother’s Day! First published in 2012, this post has been updated with new Mother’s Day drawings.